Would you, could you on a train? In the rain? Reading is fun here or there. You can take a good book anywhere! No matter where this summer takes you and your family, be sure to bring a book. Kids can lose two to three months’ worth of skills during summer vacation, and reading is an easy way to fight off brain drain. Minnesota’s weather only cooperates a few months out of the year; don’t miss it all by staying indoors! Head to your backyard or a public park with a stack of books. Don’t worry if you don’t get through all of them. You can alternate reading time and playtime to keep your child interested. Many local libraries, bookstores, even restaurants offer incentives for readers. A free book or pizza is a great motivator for little minds. If your kiddo is too young or you can’t find a program in your area, you can start your own. You could let them choose a meal or a new toy after finishing a certain number of books. Audiobooks are a great way to stretch a child’s imagination, and it’s easier on your voice! Kids love listening to books with different character voices – some even add music or sound effects. Audiobooks are a great option for long car rides without turning to a device with a screen. 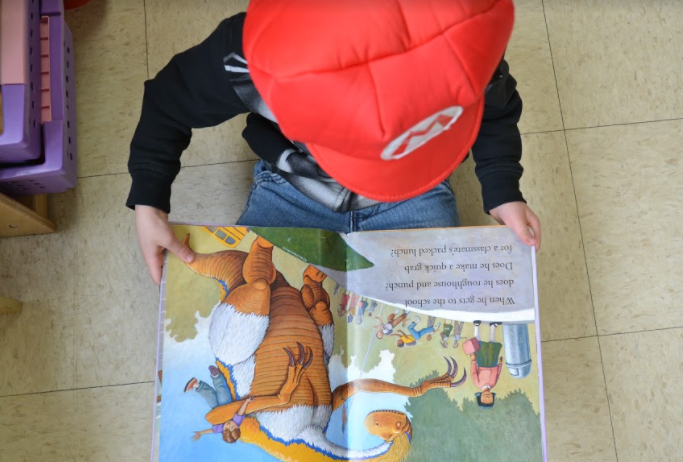 Picture books, chapter books, rhyming books… keep the options handy! Make a weekly trip to the library and let the kids pick out what they would like to read. Having a variety of books will keep the pages turning! My summer reading list, broken down by age, is below.